We are a multi-disciplinary research group focused on developing quantitative biomarkers for non-invasive, real-time assessments of tissue structure and function to diagnose disease or trauma and guide therapies. Label-free multiphoton microscopy can provide a variety of non-invasive quantitative biomarkers of cell metabolism, collagen fiber organization, and tissue composition. By quantifying the naturally present fluorescence of NADH and FAD without our cells, we can non-invasively measure dynamic changes in the metabolism of live cells, tissues, and organisms. 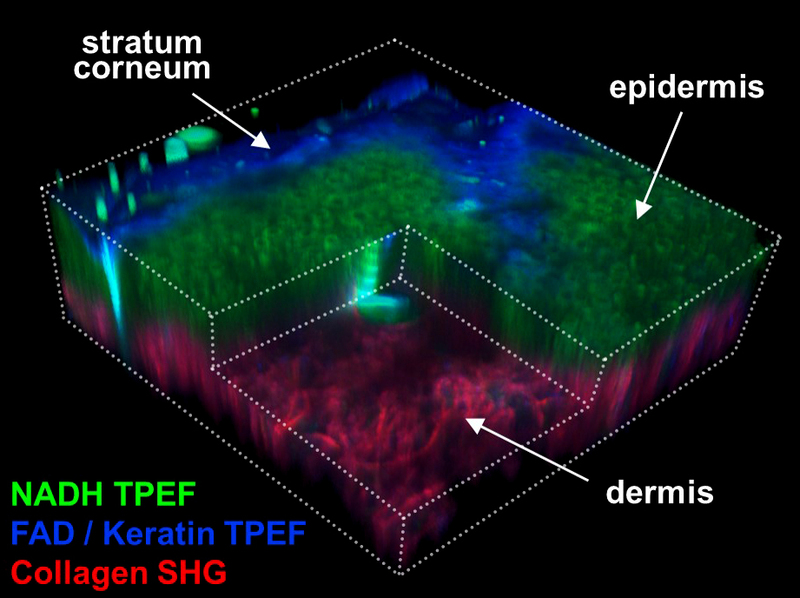 Second harmonic generation (SHG) imaging can also provide a non-destructive measure of 3D collagen organization within tissues. While acquiring two-photon excited fluorescence (TPEF) and SHG signals, we can also measure coherent anti-Stokes Raman scattering (CARS), which provides images of a tissue’s protein and lipid composition. We combine these imaging methods with advanced image analysis approaches to quantify the orientation, morphology, and fractal organization of different cell and tissue features. Quinn KP, Leal EC, Tellechea A, Kafanas A, Auster ME, Veves A, Georgakoudi I (2016). Diabetic wounds exhibit distinct microstructural and metabolic heterogeneity through label-free multiphoton microscopy. Journal of Investigative Dermatology, 136(1) 342-4. Roberts K, Schluns J, Walker A, Jones JD, Quinn KP, Hestekin J, Wolchok JC (2017). Cell derived extracellular matrix fibers synthesized using sacrificial hollow fiber membranes. Biomedical Materials, 13 (1), 015023. Lam NT, Muldoon TJ, Quinn KP, Rajaram N, Balachandran K (2016). Valve interstitial cell contractile strength and metabolic state are dependent on its shape. Integrative Biology, 8 (10), 1079-1089. Li X, Saeidi N, Villiger M, Albadawi H, Jones JD, Quinn KP, Austen WG, Golberg A, Yarmush ML (2018). Rejuvenation of aged rat skin with pulsed electric fields. Journal of Tissue Engineering and Regenerative Medicine, 12, 2309-2318. Golberg A, Villiger M, Khan S, Quinn KP, Bouma BE, Mihm MC, Austen WG, Yarmush ML (2016). Preventing scars after injury with partial irreversible electroporation. Journal of Investigative Dermatology, 136 (11), 2297-2304. Alhallak K, Rebello LG, Muldoon TJ, Quinn KP, Rajaram N (2016). Optical redox ratio identifies metastatic postential-dependent changes in breast cancer cell metabolism. Biomedical Optics Express, 7 (11), 4364-4374. Alhallak K, Jenkins S, Lee DE, Greene NP, Quinn KP, Griffin RJ, Dings RPM, Rajaram N. Optical imaging of radiation-induced metabolic changes in radiation-sensitive and resistant cancer cells (2017). Journal of Biomedical Optics, 22 (6), 060502-060502. Lee D, Alhallak K, Jenkins SV, Vargas I, Greene NP, Quinn KP, Griffin RJ, Dings RPM, Rajaram N (2018). A Radiosensitizing Inhibitor of HIF-1 alters the Optical Redox State of Human Lung Cancer Cells In Vitro. Scientific Reports, 8(1), 8815. Vargas I, Alhallak K, Kolenc OI, Jenkins SV, Griffin RJ, Dings PRM, Rajaram N, Quinn KP (2018). Rapid quantification of mitochondrial fractal dimension in individual cells. Biomedical Optics Express, 9(11), 5269-79. Dr. Michele Pierro, Vivonics Inc.
For more information, please contact Dr. Kyle Quinn (kpquinn AT uark.edu).